BRYAN EATON/Staff Photo. 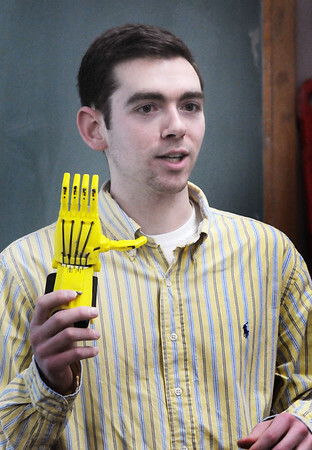 Pentucket High Bio-Mechanics teacher Matt Lovett is embarking on a project that aims to provide prosthetic hands to children with no insurance. He is partnering with Joe Fairley from Merrimack College, pictured, (speaking to Lovett's class) who has connections to E-nable, a non-profit that reaches out to people around the world with 3-D printers to download designs and print the prosthetic hands.